Fabtech's 8" Performance System has been redesigned to work in conjunction with GM?? ?s new Magna model 1625 Transfer Case in 2007. This includes new differential mounts to be used with a CV front driveshaft for vibration free operation in 4WD high. New style steering knuckles have been designed to reduce the track width as compared to early model systems. 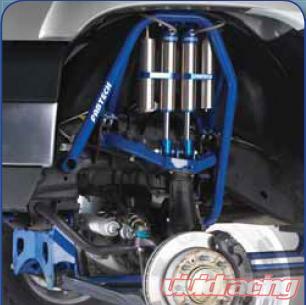 High arched lower control arm crossmembers with support tubes and impact struts distribute front suspension impact loads throughout the frame. Replacement upper control arms feature a tubular design with integrated shock tabs for use with an optional dual shock system for increased dampening. Rear lift is accomplished via a 2" Add-a-Leaf and 4" block system with extended length Bump Stops. - Fits 4WD and 2WD models. This part ships via truck frieght due to the high shipping weight of this product. Please add item to cart for shipping cost or contact us for a quote.